Careful observers wandering the halls of Disney’s BoardWalk will notice that the resort isn’t just a tribute to the shore hugging entertainment empires, it is a museum of the weird and wonderful that have populated the boardwalks. Included among these artifacts are a couple of items from another famous hotel, the Elephantine Colossus. 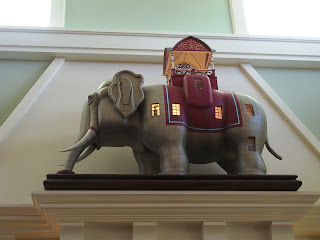 Found in BoardWalk’s lobby, a model of a stately elephant with windows and a stylish lady’s silhouette rests near a photograph featuring the fifteen story tall pachyderm inn. Known as Elephant Colossus, Colossal Elephant, or the more apropos Elephant Hotel, it was actually one of three elephant structures. The other two were known as Lucy the Elephant and The Light of Asia. The Elephant Hotel had 43 rooms, though admittedly some of them were oddly shaped or cramped in size. The Elephant Hotel was based off of the designs of J. Mason Kirby and James V. Lafferty with construction began in 1884. While word of the novelty hotel spread far and wide, especially in a pre-Statue of Liberty era, it would become all but deserted by the mid-1890s. On the evening of September 27, 1896, the elephant took its last breath when it caught on fire and howdah and all, it burned to the ground. While history would remember the past of Coney Island and its ilk, there are whole worlds of individuals who would never have had an inkling of the wonderful and colorful chapters that have come before. Luckily, guests who take the time to explore Disney’s BoardWalk can find the Elephant Hotel and a whole host of interesting tidbits to help them dip their toes into the ocean that is the boardwalk! Lucy the Elephant still exists and is open for tours in Margate, NJ, which is just south of Atlantic City. I don't know that any others are still around. It's a nice tribute! This is actually a model of Lucy of Margate. You can tell by the fact that there is only one level of windows in the body. The Coney Island Elephant Hotel had three levels of windows in the body, and externally was an approximately 2X scaled up version of Lucy.